I have spent the day researching the Florida Math Common Core Standards getting ready for my new adventure…5th grade math. It’s not like I haven’t taught it before, but it’s been a few years, and of course the standards and books have changed since then. 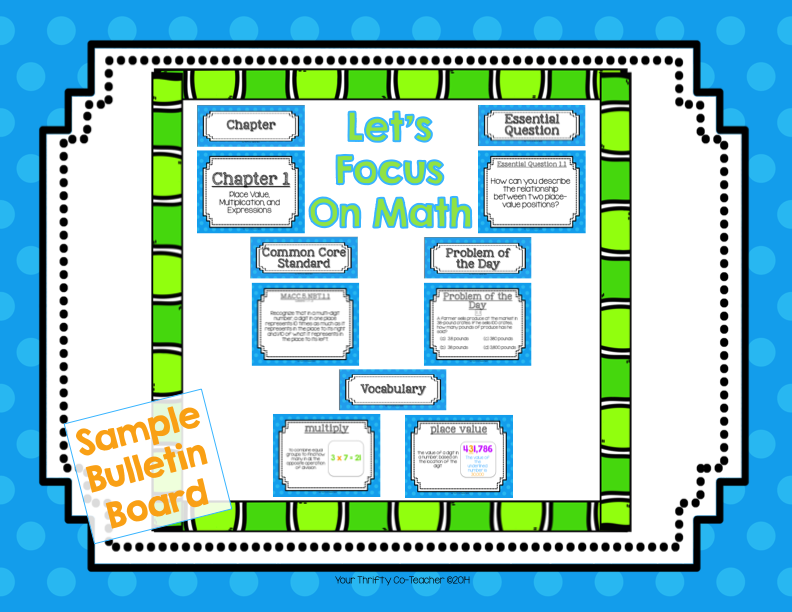 This year, I decided that I wanted to have a math focus bulletin board, so I started working on posters for chapter 1 of the Go Math book. In doing so, I made headers for each of the posters and posted them as a FREEBIE on Teachers Pay Teachers. As most of classroom ‘décor’ products, I made them in different colored sets so they match almost any classroom. You can find them by clicking on the picture below. Now, I tend to try to be as organized as possible at work and realize that keeping this board up-to-date may be a challenge if I take it on myself. My solution? I will give this job to one of my students. I plan to print these out on card stock, place them in a sheet protector in a binder, and have a student switch them out each afternoon, or morning. The headers will stay in place, but the Essential Question and Problem of the Day will change daily. My 5th grade Essential Questions and Problem of the Day posters are labeled with the lesson they pertain to, so this should make the task easy. If you are a 5th grade math teacher in Florida, you may be interested in the set I have available in my store.